Experiences instead of “things”: I decided a while ago that I would rather enrich my life with experiences than spend excessive amounts of money on materialistic possessions. While I do enjoy the finer things in life, I find I never got much joy after the purchase. Don’t get me wrong, I’m a massive shopaholic, but I’ve completely toned it down. Knowing fair well I will never be rich, I would much rather be broke and have seen the world than be broke and surrounded by a bunch of stuff. Put effort into your search: I have found some pretty sweet flight deals in my searches. But I don’t rely on one webpage to bring me that deal. I follow the airlines on Facebook, get emails about promotions, and check the prices on a variety of sites. Google Flights is a good starting point as it lists the average price of the flight and you can see it months in advance. From there, I normally check the “handy” flight websites (Expedia, Webjet, Cheaptickets, etc. ), as well as the actual airline's website that flies the specific route I want to go. Some of my best flight deals have come directly from the airline’s site. One slight warning: I was recently told I needed to search using the private/incognito browsing function. The logic behind this, if you’re searching for flights to a destination multiple times chances are you’re going to take the trip. You will not see as big of price drops due to servers accessing something or another. Stop (or reduce) Eating out: I know this is sometimes easier said than done. A good portion of American culture revolves around food and drink. When we’re happy, sad, angry, celebrating, mourning, etc. we turn to food or drinks with our friends, family, and self. But put this into perspective: Say you go to Starbucks twice a week and order a coffee. Even just reducing the frequency to once a week, you are going to save $100+ per year (this all depends on what you order, it could be much more!). Trust me, I understand how tempting it can sometimes be. My job basically requires me to eat in the short space I have driven from one client to the next. Driving through the Macca’s drive-thru would indeed be easier, but planning and packing my lunch saves me heaps of money! One Macca’s meal here is like $8 minimum. That’s a lot of money saved by not eating out! I’m not saying stop eating out altogether. That’s no fun whatsoever. But maybe instead of buying that cup of coffee, throw the money you would have spent into a jar to help save for your next holiday! Take advantage of frequent flyer miles: Since many have adopted a “use it or lose it” mentality: seriously, use your miles. Australia has amazing everyday rewards cards that give you frequent flyer miles (Someone should suggest this to American companies). Miles don’t need to be for a flight. Use it on a hotel or a rental car depending on where you’re travelling! If I find an amazing flight deal, I sometimes use my frequent flyer miles to stay in a nicer place. Don’t be afraid to stay in hostels: I’m not sure why many American’s don’t stay in hostels. Maybe it’s because most in the US are just as expensive as a nice hotel. No clue! I’m sure there are horror stories about staying in hostels, but I’ve only ever had positive experiences. Staying in a hostel is a great way to save money and a great way to meet other people (especially if you’re travelling alone). Who knows, maybe one day when you travel to that person's country? You’ll have a couch to crash on or someone to show you the area! The trip jar: I’ve adopted this practice for quite some time. All loose change gets thrown in a jar. When I go on holiday, the change from the jar is the amount of money I’m allowed to spend. This way I don’t build up heaps and heaps of credit card debt, and I stay on a budget. Change accumulates a bit quicker in AUS, so I’ve found I have a bit more to spend, but there are times I don’t end up spending it all! I then have more of a starting base for my next trips! 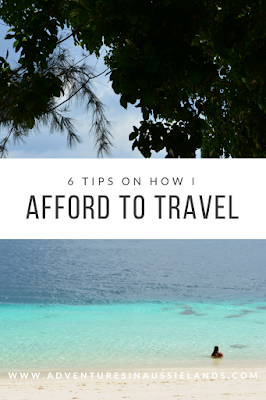 There really is no magic trick to being able to travel. If you want to travel: TRAVEL! If it means skipping out on a drive-through meal a once or twice a week to save that little bit extra, don’t be afraid to do it! I haven’t had any regrets about traveling so far. The only regret I have had is that it took me so long to jump in and explore the world.